As you know, over the last few months I've poured my heart and soul into this weekend's O.V. Wright Tribute in Memphis. 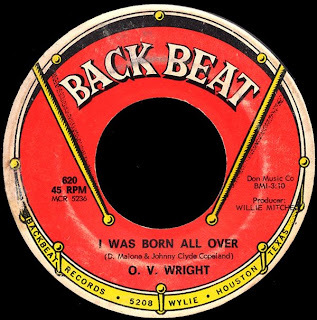 Long live Overton Vertis Wright! Thank you very much for doing this. Have a good time in Memphis. Great post as usual, thanks for all your hard work. Is there some reason we can't download these tracks anymore? Not a big fan of the new player or quicktime player. Good luck at the OV event in Memphis. Wish i could be there! It's working again! Not sure what happened, but it took a couple of days. Looking forward to reading about the show in Memphis! It's only because of this site that I've been turned on to, and I mean really in depth, to OV's catalog. I can't tell you how grateful I am for that. What an artist - that I never knew well enough except at the surface. It makes me feel rather anemic when I look back at the post I did of OV back when I first started my blog - in which you were kind enough to comment by the way. But, on the other hand, i guess it's a testament to OV's power that he would inspire someone deeply enough - who only knew a handful of tracks - to write a blog on those tracks. Have a wonderful time and I look forward to hearing of the adventure. I grew up as a child listening to O.V. Wright . I think he had one of the greatest voices of all time.